Facts and information about the History of the Native Americans including the Indian Horse culture. The horse was not indigenous to North America. Horses were brought to the country by the Europeans, a major part of their strategy to conquer the 'New World'. 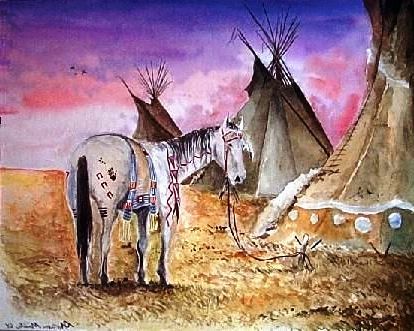 Native American Indians had never seen an animal like the horse, nor had they imagined that such an animal could be tamed and used as a means of transport and hunting. The introduction of the horse by the Europeans led to a period in history of the Great Plains Indian history called the Indian Horse Culture. The horse was introduced to the North American continent in the 1500 - 1600's. To the Native American Indians, who lived the life of a Stone Age man, the horse and its use by men, was a wonder to behold. It was at first referred to by the Native American Indians as the “Big Dog” or “God Dog”. The horse and rider team were seen as a godlike being. To retain this illusion for some years it was made illegal for a Native Indian to ride or own a horse. However, the Native American Indians soon acquired horses and this gave rise to the Indian Horse Culture. The Indian horse was often decorated in Horse War Paint in preparation for battle, as can be seen in these pictures. At first it was difficult for an Indian to acquire a horse - horse stealing and horse raids were the first option. 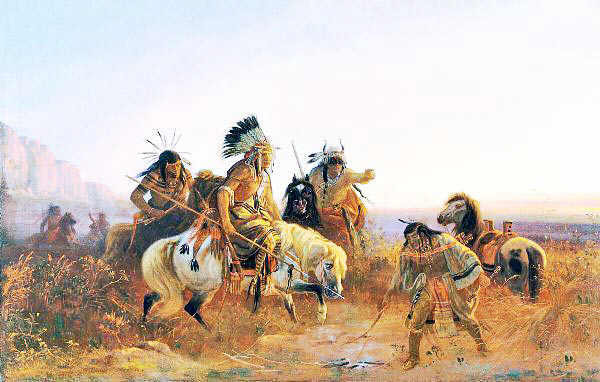 Horse stealing was seen as honorable by the Indians. A horse was of great value and the number of horses owned by an Indian gave him great prestige. The successful Pueblo Rebellion of 1680 forced the Spanish out of New Mexico and many of their horses were left behind. Famous tribes such as the Ute, Comanche, Kiowa, Apache, and other tribes in the area took full advantage of these horses. Horse trading became popular and the horses from the Southern regions soon started to spread to the North. By the 1700's the Pawnee, Cheyenne, Sioux. Crow, Shoshone, Mandan, Flatheads, Nez Perce and the Crees had all acquired the horse and had become highly skilled horsemen. 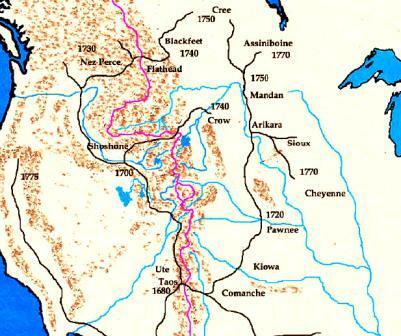 Native American Indians began to move or migrate onto the Great Plains, fully embracing the hunter-gatherer life style. Indian Horse. Discover the vast selection of pictures which relate to the History and Culture of Native Americans. The pictures show the clothing, war paint, weapons and decorations of various Native Indian tribes that can be used as a really useful educational history resource for kids and children of all ages. We have included pictures and videos to accompany the main topic of this section - Indian Horse. The videos enable fast access to the images, paintings and pictures together with information and many historical facts. All of the articles and pages can be accessed via the Native Indian Tribes Index - a great educational resource for kids.